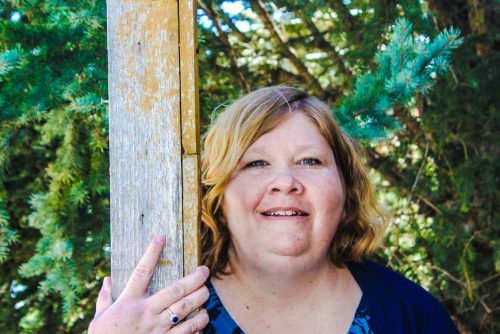 Kimberly passed away peacefully with family by her side at Dulcina Hospice in Calgary at the age of 49 years. Kimberly was a loving daughter, sister, mother and grandmother. She was predeceased by her grandparents Elsie and Jack Shedden, Doreen and Ken Ashton. She is survived by her mother and father – Peggy and Ken Ashton of Cochrane, AB; her daughters Emily Kaitlin Conaway and spouse Eric Luong of Toronto, ON and Alexandra “Ali” Brianne Conaway from Cochrane, AB; her siblings Lisa-Marie Ramer (Bradley) of La Glace AB, Krista Chenard (Anthony) of Red Deer, AB and Gregory Ashton of Cochrane, AB; as well as two grandchildren Ezra and Lucy Luong of Toronto, ON. Kimberly loved crafts galore. Her latest project was knitting a blanket which was half done at the time of her passing. She also loved painting and Rubik’s cubing. She was a fan of hockey and especially the Edmonton Oilers. She loved heading into the mountains and getting to know God’s will and His word. She played goal for the Cochrane Ladies soccer team. She gave freely of herself to those in need. Her cousins will miss the online games she took part in with them. We will miss her and will always remember her kindness to others. A Celebration of Kimberly’s Life will be held on Friday May 19, 2017 at 3:00 pm at the Bow Valley Baptist Church ( 54 W. Aarsby Road, Cochrane, AB ). Donations can be at your personal choice. Deepest condolences from myself and the whole Beger family. I have fond memories of many sleepovers at the Ashton home with Krista – her sisters Kim and Lisa always nearby and admired by us. May God’s grace and love be felt strongly by your whole family. We have never met Kimberly but knew of her through her parents Ken and Peggy. She will be missed greatly. In Jesus arms. Praying for all as you go through your mourning time. Love you. I’m so sorry for your loss. I only HDknow Lisa and Brad, that because of school in Seattle. I had hoped and prayed Kimberly would have beat this but life deemed things be different. I pray you all will be able to grieve and heal as the days go by, knowing that you will see her again one day. Lisa and Brad it was so good to get to know you. Lisa my friend and sister in Christ, you and your family are in my prayers as you hold and comfort eachother. God bless and keep you all in His Comfort and Love. I am so sorry for your loss. May God send his angels to surround and support you. Truly sorry for your loss. Personally I will miss those online conversations with Kim’s great sense of humour. She knew how loved and treasured she was and I hope that brought her comfort in this struggle. Her spark lives on in Emily, Ali, Ezra and Lucy. We will always hold her dear in our hearts and memories. Bye dear cousin. To the family of Kim, How you (and we) will miss Kimberly. And yet I can only imagine how much she is enjoying life in Heaven with Jesus. God has released her from all this earthly pain and given her a healthy body. Praying you will feel God’s loving arms supporting you during this time of grieving. Ken & Peggy our hearts go out to you and the girls. A parent never plans to outlive their children. May you take consolation that she is not suffering any more and is in the presence of Jesus, and may God’s peace comfort you as you grieve her absence on earth. When we love well we will grieve deeply. This is what makes us human. Our love and prayers to you all. Kim is sharing her lovely smile within the Heavens. My prayers of comfort and strength be with all of you during this time. We did not know Kim, but we know her family and we know her God. Praying for you all in these days of loss. May the hope of the Resurrection sustain you. Kim brought joy and light into her world as she touched people with her positive attitude and desire to live her life to the fullest. She had a wonderful relationship with God and leaned on Him to help her with her challenges in life. I loved visiting her there in the hospice and found myself personally encouraged as I left after each visit. She will be missed by all of us! My most sincere condolences to Kim’s family. May she rest in peace and be forever in your hearts. I never had the chance to meet Kim, but I have heard about her from her sister Krista. My sincere condolences to the family and friends. May she rest in peace and let her memory of her life, live on and allow you to heal. We’re praying for God’s comfort for you all! We were privileged to know all of your family growing up & playing with our boys! We know that God will keep you under the shadow of His wings! So very sorry to hear this. Kimberly was a sweet lady. She faced adversity with such grace. Condolences to her girls and extended family. Kim was a very special person in my life, She felt that forgiving was the best when someone hurt you. She never held a grudge and helped many to forgive. Kim’s positivity, faith in Jesus and love for everyone around her was an inspiration to me and many others. We’re already missing her. It has been many years since I’ve seen Kim, but I do remember her smile and her energy. She was such a lovely lady. Ali and Emily, I am so very sorry for your loss. She is no longer in pain and is resting in God’s arms. May you find peace in the days and months to come.